Indium Corporation’s Evelyn Lu, Bench Chemist, left, accepted the “Best Paper” award on Ma’s behalf. 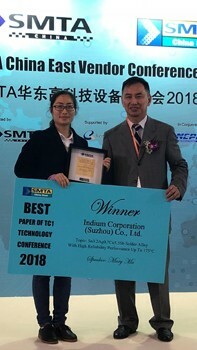 Indium Corporation’s Mary Ma, Research Chemist, was presented with the “Best Paper” award at the SMTA China East Technology Conference 2018 on April 23-26 in Shanghai, China. Ma’s paper, Sn3.2Ag0.7Cu5.5Sb Solder Alloy with High Reliability Performance up to 175°C, reviewed the testing results of her efforts to achieve high-reliability under a wide range of high-temperatures using the lead-free solder alloy also known as Indalloy®276. Her paper found that in order to achieve this, it is imperative to balance a solder alloy’s ability to handle tensile stress versus its rigidity. Ma joined Indium Corporation in 2010 and is based in Suzhou, China. She is responsible for developing halogen-free, lead-free, and no-clean flux chemistries with low-voiding. Ma earned her bachelor’s degree in Chemistry from Qufu Normal University and her master’s degree in Physical Chemistry from Nanjing University.